The New Orleans political dynasty headed by disgraced ex-Congressman William Jefferson and his brother Mose Jefferson, the political operative, continues to crumble. The New Orleans Times Picayune reports that less than a month before trial, the ex-Congresman’s sister Betty Jefferson,70, a 4th District Assessor, and her daughter Angela Coleman, 53, pleaded guilty Thursday in U.S. District Court to a conspiracy charge for pocketing money from political office and non-profits they controlled over 7 years. 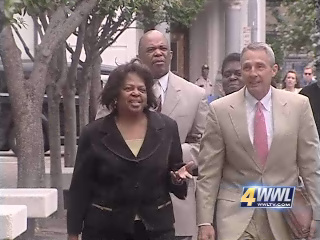 The guilty plea still left in question the future of Jefferson’s brother Mose and his companion Renee Gill Pratt, a former city council member and state rep, who are still scheduled to go to trial March 22 in the case. Mose Jefferson was recently sentenced to 10 years in prison for bribing a school board official. He has been out free awaiting his latest trial. Posted: 2/26/10 at 8:40 AM under News Story.